This edition of Mentor Online is adapted from the work of Roy Oswald, The Alban Institute, 1992. This graph depicts the reality that parishioners perceive the clergyperson in two major roles: pastor and leader. The Pastor line indicates that the longer that a traditional minister serves a specific congregation the more that that person’s pastoral role is valued and appreciated. This line may plateau or dip over time but for the most part the pastoral care offered and received results in a growing intimacy and the clergy person is increasingly cherished or treasured. 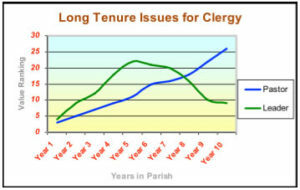 The Leader line of the graph depicts an often frustrating though typical reality for clergypersons that serve a congregation for a decade or more. At about the fifth year of the period of service the system begins to wonder whether the person has the skills, energy and passion to take the congregational system to the next level of faithfulness. This conjecture about the management abilities of the clergyperson are at first almost unconscious and then emerge unexpectedly at surprising moments as a congregation decides it future related to staffing, construction programs, ministry development and a host of other ‘next step’ strategies. There is a repetition of this phenomenon about every 5-7 years if the clergyperson remains for more than 15 years..
To alleviate this automatic inclination in congregations, the advice of Oswald and others, is for the clergyperson to negotiate with a congregation’s notables for time, funds and permission to acquire or enhance the tool kit for ministry.